Cooler and wetter conditions early in 2017 have set the stage for a favorable supply of freshwater. River flows are all above normal due to melting of the abundant snowpack from warmer May air temperatures. This is creating significantly fresher conditions in Puget Sound surface waters. Algae blooms are limited to some yellow-green blooms growing in bays near the Kitsap Peninsula and blooms near estuaries of the Skagit, Stillaguamish, and Puyallup Rivers. Red blooms are present in rivers feeding into Willapa Bay. Also see what is “blooming” in the sediments of Puget Sound. Description Cooler and wetter conditions early in 2017 have set the stage for a favorable supply of freshwater. River flows are all above normal due to melting of the abundant snowpack from warmer May air temperatures. 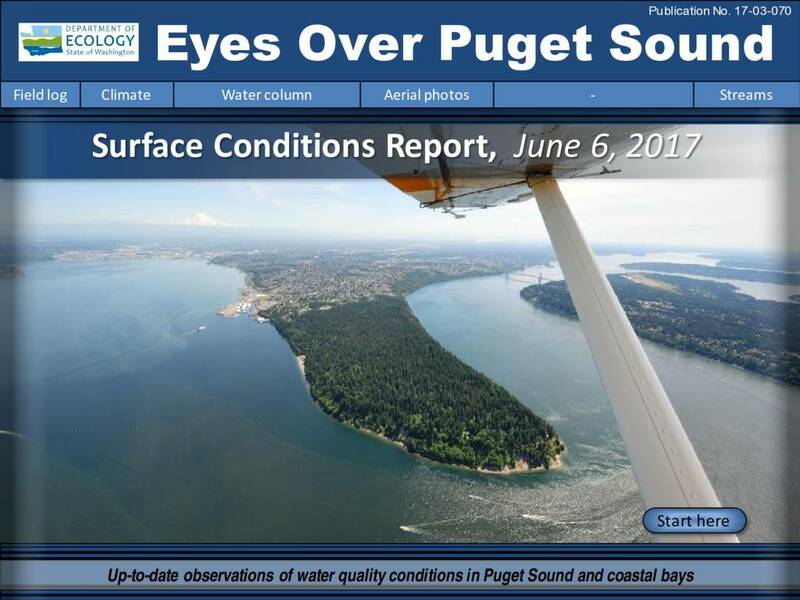 This is creating significantly fresher conditions in Puget Sound surface waters. Algae blooms are limited to some yellow-green blooms growing in bays near the Kitsap Peninsula and blooms near estuaries of the Skagit, Stillaguamish, and Puyallup Rivers. Red blooms are present in rivers feeding into Willapa Bay. Also see what is “blooming” in the sediments of Puget Sound.